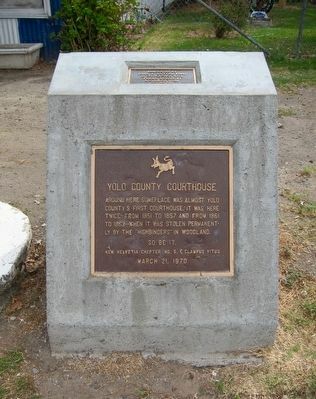 Around here someplace was almost Yolo County's first courthouse, It was here twice -- from 1851 to 1857 and from 1861 to 1863 -- when it was stolen permanently by The "Highbinders" in Woodland. Erected 1970 by New Helvetia Chapter No.5, E. Clampus Vitus. Location. 38° 35.317′ N, 121° 30.839′ W. Marker is in West Sacramento, California, in Yolo County. Marker is at the intersection of C Street and 6th Street, on the right when traveling east on C Street. Touch for map. 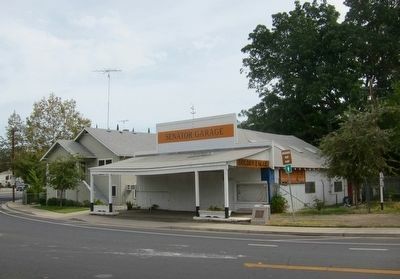 Marker is at or near this postal address: 521 C Street, West Sacramento CA 95691, United States of America. Touch for directions. 2. 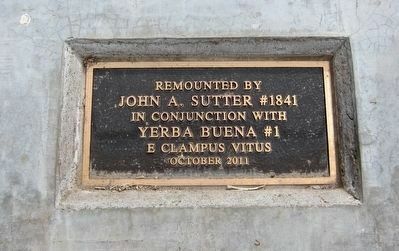 Yolo County Courthouse Marker - Rededication/Remounting Plaque. This is the marker's second location. It was originally mounted to a portion of the I Street Bridge (several blocks away), but eventually disappeared at some point. It was rediscovered and then remounted at the new location in 2011. (approx. half a mile away); Salmon Cannery (approx. half a mile away); First Pacific Coast Salmon Cannery (approx. half a mile away). Touch for a list and map of all markers in West Sacramento. Regarding Yolo County Courthouse. "Highbinders" = corrupt politicians. The marker is visible here, mounted on the face of a low stone monument just to the right of the building. More. 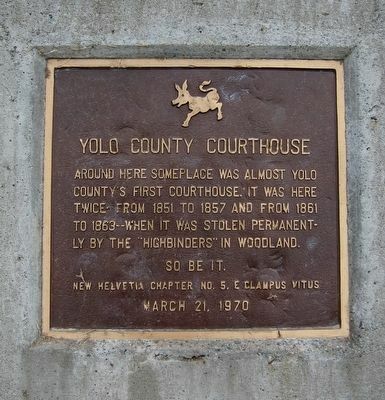 Search the internet for Yolo County Courthouse. Credits. This page was last revised on June 16, 2016. This page originally submitted on September 28, 2015, by Andrew Ruppenstein of Sacramento, California. This page has been viewed 280 times since then and 12 times this year. Photos: 1, 2, 3, 4. submitted on September 28, 2015, by Andrew Ruppenstein of Sacramento, California.